At the Chinese New Year event were: William Olphert, managing director Chinese Welfare Association, Detective Inspector John Caldwell, Danny Wai Ching Wong MBE, Chinese Chamber of Commerce and Detective Chief Inspector Eamonn Corrigan. Submitted photo. Detectives investigating the murder of businessman Nelson Cheung have produced crime prevention advice specifically aimed at the Chinese community. The bilingual publication has been produced by detectives from Serious Crime Branch investigating the murder of Mr Cheung outside Randalstown in January. DCI Eamonn Corrigan, who heads up the murder investigation, said: “Our enquiries brought us into close contact with the local Chinese community, those who operate businesses and with the Chinese Welfare Association. Three men have been charged with Nelson Cheung’s murder and face a series of other charges including attempted murder, robbery, attempted robbery and burglary. 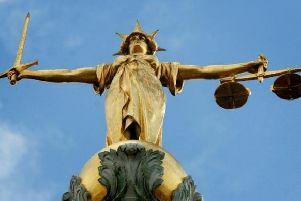 A 32-year-old woman has been charged with perverting the course of justice and handling stolen goods. Two teenagers arrested in the early stages of the investigation were released pending a report to the PPS.